3-5 year classes enable children to engage with yoga through a storytelling format with yoga postures entwined through role play. Children will learn postures, breathing techniques and relaxation methods by imitating animals and nature. 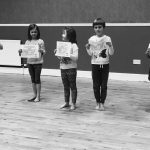 Children will progress with age and stage, in a happy and fun environment, receiving a certificate at the end of each block summarising their achievements. 5-8 year classes will allow children to build on their yoga knowledge, progressing onto more complex postures. Themed classes will encourage yogis to work collaboratively through fun yoga games and partner postures. More attention will be paid to refining their practice, with more detailed breathing and relaxation techniques. Yogis will continue to receive certificates at the end of each a block, summarising learning. 8-12 year classes aims to equip our yogis with the life skills to navigate the emotionally challenging preteen years. During a time of many internal and external changes, we focus on self regulation, putting life’s obstacles into perspective. This age group concentrate more on the alignment of poses, utilising the yogic breath, practicing individually and working collaboratively, spending more time on relaxation and meditation. There is a greater exploration of the many branches of yoga, learning that yoga is more than poses, but is a discipline that aims to improve your overall health and wellbeing. These classes aim to boost confidence, bringing healthy body awareness, whilst calming and centring the mind, supporting the transitions into the teenage years. Children's yoga aims to provide a path towards a calm and balanced mind, as well supporting physical fitness in a non-competitive environment. Yoga is a great medium to support the mental, emotional, social and physical wellbeing of children as they develop and grow. Check out : http://www.kidsyogastories.com/kids-yoga-poses/ for ideas of poses to do with your children at home.